Featured Song "Kootie Pie Rap"
"Fire Sale" is the first episode of the Super Mario World animated series. While admiring her reflection in the ice of her recently gained Ice Palace, Kootie Pie Koopa laments that the place is perfect, except for one thing: it's always freezing. Throwing a temper-tantrum, Kootie Pie proceeds to beat her Koopa Troopa henchman so badly that the Koopa Troopa is sent careening out of his shell and into a nearby wall. Pulling her minion out of the wall, Kootie Pie comes-up with a plan, go to Dome City and steal "Mama Fireplant", who can warm up the Ice Palace. At Dome City, Mario, Luigi, Princess Toadstool, Yoshi and several cave people are beginning to set-up a barbecue; unfortunately, Yoshi eats up almost all the food. Managing to stop Yoshi from eating everything, Luigi decides to send Yoshi to get some fireballs from Mama Fireplant, while Mario, Luigi and Princess Toadstool get more food. A nervous Yoshi tries to refuse to go to Mama Fireplant, being afraid of crossing a river to her dome-house; eventually though, he does set off. While Yoshi is going to her house, Mama Fireplant notices that something is coming-up the grate in her floor. Suddenly, Kootie Pie and her Koopa Troopa accomplice pull themselves out of the grate. Announcing her plans to kidnap Mama Fireplant, Kootie Pie is subsequently blasted with several fireballs launched by Mama Fireplant. Managing to dodge several more fireballs launched by Mama Fireplant, Kootie Pie proceeds to plug-up Mama Fireplant's mouth with her Koopa Troopa henchman's shell. With Mama Fireplant defenseless, Kootie Pie and the Koopa Troopa begin pushing Mama Fireplant towards the grate-hole in the floor. Outside Mama Fireplant's dome-house, a nervous Yoshi is preparing to cross the bridge to Mama Fireplant's residence. As Yoshi makes his first few small steps, Mama Fireplant manages to spit the Koopa Troopa's shell out of her mouth and begins screaming for help. Hearing Mama Fireplant's cries, Yoshi rushes to Mama Fireplant's dome-house, but ends up tripping and falling into the river. Ignoring the water, Yoshi rushes to Mama Fireplant's dome-house, only to find it empty. Returning to Mama Fireplant's dome-house with Mario, Luigi and Princess Toadstool, Yoshi aids the three in looking for clues as to where Mama Fireplant went. After some looking, Mario notices that there is Warp Tube under the grate in the floor. Lifting the grate cover up, Mario accidentally stumbles into Luigi, who steps backwards on a cube of ice and begins to slide around the floor. Eventually, Luigi stops sliding around and points out the ice to Mario, who believes the ice came from Ice Land, which is where Mama Fireplant must have been taken. Leaping into the Warp Tube, Mario, Luigi, Yoshi and Princess Toadstool come out the other end and begin to fall through the sky. Luckily, Mario, Luigi, Princess Toadstool and Yoshi land on a moving platform. Unfortunately, the platform is sent flying through the air after reaching the end of its bar. Free-falling once again, Mario, Yoshi and Princess Toadstool safely land on another, unmoving platform; Luigi is not as fortunate, though; missing the platform, he can only feebly grasp the end of it. As Mario tries to pull his brother up onto the platform, a swarm of Flying Goombas appears. Diving down at Mario, the Flying Goombas miss him, although this attack manages to distract Mario so that he lets go of Luigi's arm, dropping him to the ground below. As the group of Flying Goombas swing around for another attack, Mario jumps up onto several nearby platforms and, leaping through the air, manages to beat up the Flying Goombas. Unfortunately, Mario is then sent plummeting through the air. Grabbing Mario, Princess Toadstool is dragged off the platform, along with Yoshi. Tumbling downward, Mario, Yoshi and Princess Toadstool fall through a Warp Tube, which deposits them into Kootie Pie's rapidly melting Ice Palace. Finding Luigi in a pile of slush, Mario realizes that all this slush can mean only one thing, Ice Land is melting due to the heat exhumed by Mama Fireplant. In Kootie Pie's throne room, the spoiled Koopaling is enjoying the warmth given off by Mama Fireplant's fireballs. Pleading with Kootie Pie to return her to Dome City, Mama Fireplant says without her, the cave people will freeze. Kootie Pie, seeing an opportunity to make a fortune, decides to simply sell Mama Fireplant's fireballs to the cave people at an outrageous price (hence the episode's title). As Kootie Pie begins to gloat, Mama Fireplant begins to shoot a large amount of fireballs, causing any nearby ice to melt and begin to flood the place. As the water level begins to rise, Mario, Luigi, Princess Toadstool and Yoshi burst into the throne room. As Mario charges at Kootie Pie, he accidentally steps on a Porcupinefish and becomes paralyzed. Rushing to Mario, Luigi and Princess Toadstool accidentally step on some Porcupinefish as well. 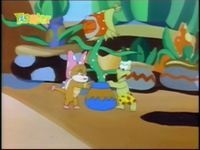 Suddenly, Kootie Pie begins to charge towards Yoshi, only to step on a Porcupinefish herself. As the Ice Palace begins to collapse, Yoshi faces his fear of water and rushing through a small river, he manages to reach Mama Fireplant. Using Mama Fireplant's pot as a sled, Yoshi manages to slide out of the Ice Palace, grabbing Mario, Luigi and Princess Toadstool as he goes. Having escaped Kootie Pie's Ice Palace, Mario, Luigi, Yoshi, Princess Toadstool and Mama Fireplant return to Dome City, where they begin their barbecue with the cave people. Meanwhile, back at Ice Palace, Kootie Pie, having become frozen in a block of ice, can only scream in frustration as her now sunglasses-wearing Koopa Troopa minion relaxes in a nearby hammock, drinking a glass of soda and reading a Crime magazine with King Koopa on the cover. Throughout the episode, the coloration and placement of characters continually shifts in different scenes, such as Mario's hair turning black in one shot. When Yoshi asks himself if he has to cross the bridge, his eyes are shrunk. When Kootie Pie and the Koopa Troopa are opening the manhole, the latter's shell is light green. Mario's cap has a white "M" and no white background when he and Luigi notice Yoshi eating the barbecue. Just before Yoshi, Mama Fireplant and the others leave Kootie Pie's cave, Yoshi doesn't step on a Porcupinefish but he looks frozen by one. When the Princess notices the Flying Goombas her lips are missing. When Mario says "Kootie Pie! ", he mouths the words but doesn't say them. 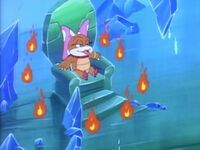 Despite "Fire Sale" being the first episode of the Super Mario World animated series, the bulk of the episode takes place in Ice Land. Kootie Pie has a speaking role. A Koopa Troopa is featured. 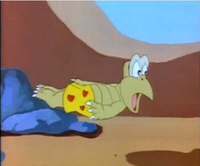 The scene where Mario defeats the Flying Goombas is shown in the Italian opening to The Adventures of Super Mario Bros. 3. This version of Ice Land has more in common with the frosty underground levels of Super Mario World, as it is depicted as an icy cavern. While Yoshi can go into aquatic levels in Super Mario World, he is afraid of water in this episode. ↑ May 20, 2015. 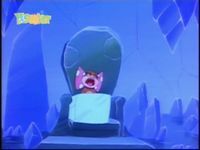 "Fire Sale", dubbed in Romanian by KidsCo. Odnoklassniki (OK.ru). Retrieved January 4, 2016. This page was last edited on April 7, 2019, at 11:17.